Staff at universities across the UK voted overwhelmingly for strikes and other forms of industrial action to resist savage – and wholly unnecessary – proposals to cut our pensions. Under the new scheme, our pensions will be gambled on the stock market and the average loss for a new starter is likely to be some £208,000. Why are the employers so determined to push this through? Universities are raking in huge amounts of money from £9000+ tuition fees but are reluctant to invest this in things that will improve the quality of education: better staff/student ratios, smaller classes, more motivated and secure staff and fewer temporary contracts. Instead vice-chancellors are being paid huge salaries (Goldsmiths’ contribution to the Warden’s pension in 2017 alone was £46,000). 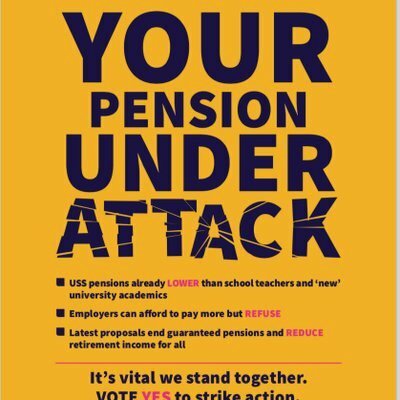 This attack on staff pensions is an attempt to shift pensions liabilities from institutions to individuals themselves, and is part of a wider shift in higher education to embrace market forces and competition. It is a situation in which students are seen as ‘customers’ and staff as a ‘cost’ to be minimised. But aren’t staff at Goldsmiths paid too much already? Since the introduction of tuition fees, staff costs as a percentage of total income have fallen from 61.8% in 2007 to 60% in 2017. Student fees have not gone into paying staff more! But isn’t the pension fund in debt? It depends whose figures you believe. The employers have chosen to use the most pessimistic (and unrealistic) scenario of widespread university closures that, not surprisingly, shows a deficit. In reality, the scheme receives each year much more than it pays out and runs a healthy surplus. What are staff actually planning to do? Members of UCU will be on strike on February 22-23, February 26-28, March 5-8 and March 12-16. We will also be ‘working to rule’ which means not taking on any additional or voluntary duties. We will be picketing the College on all these days and organising ‘teach-outs’, short talks by staff and visitors, about a range of relevant topics. Won’t this hurt students unnecessarily? The dispute comes about as a result of the refusal of the employers to negotiate seriously. We know that this will have an impact on students, but hope that they will direct their understandable frustration at the employers and not at staff who are seeking to maintain a high-quality university education system. Students can take up their grievances by emailing warden@gold.ac.uk. What can I do to support the strike if I’m not a member of UCU? If you’re a member of staff in a relevant grade or a postgraduate student, please join UCU! Whoever you are, please spread the word about the dispute. During the strikes, we would ask everyone NOT to cross our picket lines if at all possible and to take part in the activities we plan to organise. Please email the warden@gold.ac.uk to ask exactly what Goldsmiths is doing to bring the employers back to the negotiating table and how it plans to address the real concerns of staff and students at such a critical time. You can visit www.goldsmithsucu.org to find out more about the dispute.